Phosphates are the naturally occurring form of the element phosphorus, a primary, nutrient-rich element essential for crop growth. It cannot be manufactured or replaced. Phosphorus has many commercial uses in manufacturing and everyday products, but is most important as a component of fertilizers. Inorganic phosphates are mined to obtain phosphorus for use in agriculture and industry. The phosphorus within phosphate rock is usually bound within a calcium-phosphate mineral, called apatite or as one of several phosphates, or salts of phosphorus, such as P2O5. The largest deposits are found in North Africa, US and China, although other deposits occur, most often as sedimentary higher grade deposits or as lower grade igneous phosphate rock that is beneficiated. Phosphorus is a limited non-renewable resource that cannot be produced synthetically. Commercial uses of phosphorus include water treatment, detergents, animal feed, human food and other industrial applications. 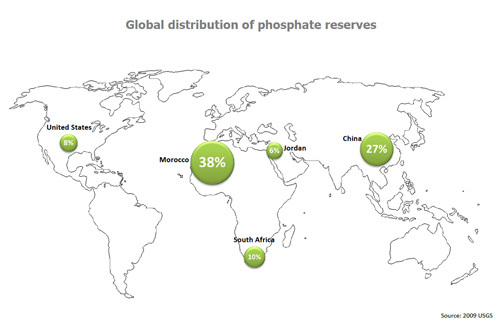 By far the most important use of phosphate is in the production of fertilizers. Essential to photosynthesis and plant growth, phosphorus (P) is one of three key elements along with Nitrogen (N) and Potassium (K). 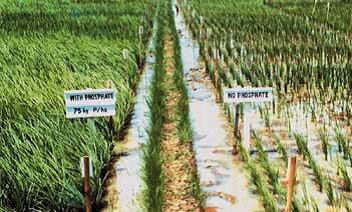 Phosphorus is used world-wide as both a direct application fertilizer and in chemical-based fertilizer. The USGS¹ estimates that 95% of the global production of phosphate is used in agricultural production to feed an ever growing world population.